If you are growing from seed, start the seeds off early, in late winter. If you’re in the northern hemisphere, get your skates on. Keep them warm and moist, but don’t plant out until Jack Frost has finished his rounds. Remo, the gardener in our family (I’m just the weeder! ), usually hardens them up by moving the seedlings to a sunny spot during the day, then putting them somewhere warm overnight for a week or so before planting out. Plant them in a sunny spot in the garden in soil containing plenty of well-rotted compost. They do particularly well close to a brick wall, or something similar, because bricks absorb the heat during the day and give it out during the night, keeping them warm. Think of them like little babies! No garden? Grow them in deep tubs – we’ve grown brilliant crops this way, and you then have the advantage of being able to move them in and out of the sun or wind. The disadvantage is that you’ll most likely need to water them daily in hot weather. Alternatively, put the pots in deep saucers or containers and keep these filled with water so the plants can lap it up when needed (allow for evaporation). 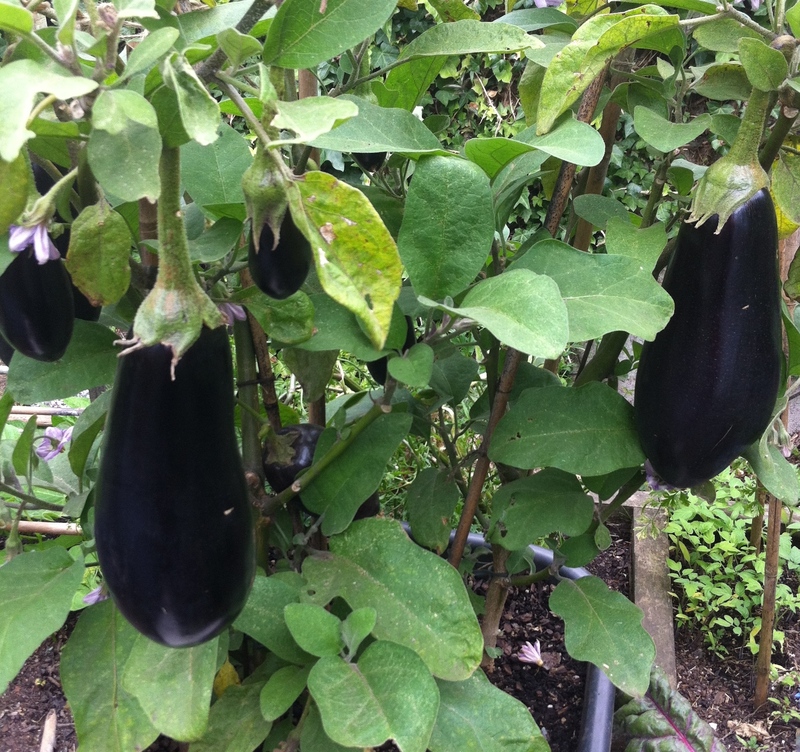 We (Haha, that’s the husband Remo again), always stake our eggplant plants. That means you put a supportive stick or cane in the ground for the plants to grow around (or you can tie them to it if you live in a windy spot), but you need to do this before the roots have developed too much or you’re likely to sever roots with the stick when you put it in the soil. That would be a shame after all the mollycoddling. Keep the plants well watered, a big soak every 2-3 days is better than a splash and a promise every day. Mulchy stuff put on top of the soil will help retain moisture and warmth, though leave the stems clear so you don’t build up humidity which can bring on rot. Sometimes the bees are a long time coming, so Remo gently brushes or taps the flowers to dislodge pollen to help fertilise the flowers. It works! Up to you whether you make a buzzing noise or not as you do it. Feed the plants every few weeks during flowering with an organic liquid plant feed to keep them flourishing. If you seek advice at a gardening centre you’ll most likely be told to feed the plants once a week. That’s because they want to sell you more product. Living in a windy area? Construct an open-topped sort of tent thingy out of clear plastic and stakes around the plants. Not only will this protect the plants from wind, but it will keep in warmth, so it’s great for cooler climates. Wonder whether my granddad tried that. Just make sure you remove the plastic before hot weather sets in or you will either encourage humidity and end up with rotting plants, or in dry climates you’ll fry the leaves! And, finally, at harvest time, slice fruit off the plants with a sharp knife so you leave a clean cut, and wear gloves because the spikes are sharp! A homegrown eggplant picked while it is weighty, taut and glossy can keep for up to 2 weeks in the fridge, but why wait that long! Eat ‘em up I say.